Food additives, also known as 'E numbers', are in nearly all foods and drinks, and it helps to know something about them. The Enumber that you see on food labels is a number assigned to food additives .  E151 Brilliant Black BN, Black PN – brown sauces, blackcurrant cake mixes.  E621 – known as MSG can cause symptoms such as headaches, nausea, dizziness, muscle pain, palpitations and even pain.  E951 –a sweetening ingredient found in desserts, low-fat foods, low sugar drinks, snacks and sweets.  E211 – used as a preservative and is found in products such as margarine, salad dressing, soy sauce, sweets and soft drinks.  E133 – brilliant blue FCFsynthetic blue colouring dye, which adds a blue colour to some products.It causes allergy symptoms. Many of these artificial food preservatives, food colors and flavor enhancer are dangerous chemicals added to our food and are known to be linked to Hyperactivity, Attention-Deficit Disorder (ADD), Asthma, Cancer, Poisonings and other negative medical conditions. G.I.TO IS is concerned about health issues and food safety standards and requirements that are set out at the national level. G.I.TO always seeks to follow the recommendations of world health organizations regarding food safety measures. It focuses on the more technological aspects of food safety and the application of food safety management systems. 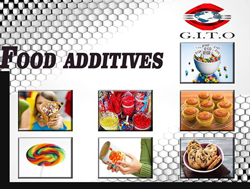 To implement food safety systems that are designed to ensure food is safe to consume, and to protect consumers from toxic substances and from fraud;THAT IS WHAT G.I.T.O ALWAYS LOOKS FOR..